Jamie Gold is hoping to return piles of cash for his YouStake investors. 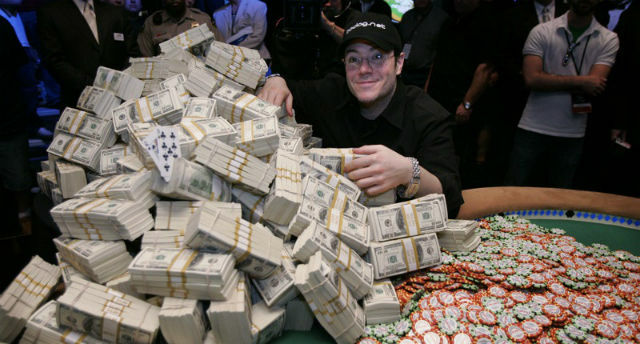 Ten years ago, before the reigning World Series of Poker Main Event champion was even out of high school, Jamie Gold entertained, confused and shocked the poker world by winning the largest WSOP Main Event in history. A record 8,773 entrants, along with Gold’s $12,000,000 purse for the victory, still stand as the biggest ever in Main Event history but over the last decade, the excitement of the win has never subsided. “It’s never the same but there are is always going to be new excitement,” he said, referencing he return to the game from a six year hiatus that started with a final table during last summer’s WSOP. Gold finished fifth in an over 2,100 player $1,500 No Limit Hold’em event, something that proved to himself that he was back and something he predicted. “I planned on playing six events last year and predicted one final table for my backers, so that was the most satisfying.” he said, while also mentioning that his training leading up to last summer was similar to his preparation when he won poker’s biggest prize in 2006. “I was so focused on winning the Main Event, I trained for years with the best players in the world and was so lucky it happened on my first shot,” said Gold. “I’ve been able to experience the incredible joy of giving back with some of the most wonderful people on earth, including my family and friends. Together, we’re working for the greater good and for that I am continually fortunate,” said Gold. While his philanthropic efforts mainly extend outside the poker community, this summer, as an investor and ambassador of YouStake.com, Gold is hoping to give back to his backers. Gold believes that there is a need for a safe, secure and public marketplace where anyone from any country can be involved and knows that YouStake is that marketplace. As for his own game, he made sure that he was going to make his backer’s pieces count if he was going to put his name on a package. So far, so good for those taking pieces of Gold, as he’s averaging six-to-one return on investment over the last two years. Gold is a serious investor away from poker and he’s made sure that he’s had a real track record before offering packages on YouStake. Gold isn’t only trying to change investing within the poker community but also the entertainment factor, something he knows a thing or two about. Whether it be putting Phralad Friedman’s brain in a pretzel during the 2006 Main Event or a nearly $750,000 pot on High Stakes Poker againstPatrik Antonius, Gold has always been one of the more colorful players on the felt. “I feel like poker has lost it’s excitement on TV,” Gold admits, while saying he’s been working on a few celebrity based poker shows for television to get content to the masses. Those shows are still in their infancy but that ‘excitement’ could come sooner, rather than later, if Gold is able to regain his Main Event form this summer. “It would be a blast,” Gold said in reference to another deep run in the Main Event run but in the end, he mostly wants to do it for the backers. His WSOP Main Event package sold out in less than a day, so Gold has also begun selling for the $5,000 Venetian Deep Stack Extravaganza III Main Event and the $10,000 Bellagio Cup XII. Both of those events begin after the Main Event. Interesting has never been a problem for Jamie Gold and over the next few weeks, he’s hoping to make it a very interesting end to the summer for his YouStake.com backers. I?d told him everything i know about Bankroll manegment years ago !